Liz Wiseman is a former VP of Oracle University and now runs a consultancy business in the States. Working with Greg, a British consultant, they conducted extensive research which is well explained and justified in the book to prove their claim on this new and ground breaking Leadership Model. The Forward by Steven Covey is impressive; he praises the book as one that will relate to your life today and will connect with your conscience. I found this short sentence to be so powerful and true – the book makes you stop, think and question your behaviour all the way through. It is also a very timely message, as the current economic climate means we can’t just hire extra bodies, we need to get the most out of the people we have, multiplying the intelligence from within the team. Multipliers gives you practical and easy to understand ways to get two times more from your resources by turning your most intelligent resources into intelligence Multipliers. These root cause assumptions are important to understand and simply behaviour follows assumptions. You can’t think like a Diminisher and act like a Multiplier. Through the research, Wiseman identifies five disciplines of a Multiplier and the opposite behaviours witnessed from Diminishers. The book is methodical in its description of each, with many examples for us all to relate to. In my experience, I believe the culture of the region pushes managers into the Diminisher side of the spectrum. Many organizations have a fear culture and managers feel part of this, trying not to lose face or be exposed, they hog the limelight and want to be seen as the solution provider to all problems. One of the chapters that resonated most with me was that Multipliers were not ‘feel-good’ managers. They were tough, demanding and exacting. Rather than achieving results in a directive way, they set clearly defined challenges to their team. Showing they believed in them, scoping out expectations and offering to be available if support was needed. But they did not micro-manage or interfere. They trusted, stretched their intelligent resources and then applauded as amazing results were achieved. The research showed that Multipliers attracted talent – people wanted to work for them. Most employee engagement surveys show the number one reason people leave an organization is because of their manager. They don’t feel any growth, opportunity or recognition. Having read the book, I can safely say the number one reason people leave an organisation is they are being managed by Diminishers. If the book’s promise – that a Multiplier Leader can get twice as much capability out of staff – is a reality, then it must be something every organisation needs to look at seriously. Many of the behaviours in the book are common leadership competencies; however, it’s the way they’ve shown the positive impact of these behaviours and some of the techniques and tools for changing your leadership style that make it new and refreshing. A great example of these techniques helps you to become a better challenger – go extreme with questions. The root of this technique as a leader is to stop answering questions and start asking them. I found this highly enlightening and very frustrating because it is hard! Try for a whole management meeting to just ask questions of the team, rather than make any statements or provide any answers. It’s difficult and quite unnatural, but it helps you realise how often you are normally diminishing input from others. In reality you should settle for a balance, asking challenging questions the majority of the time. A great question once you’ve agreed a stretching challenge for someone: “what do you need from me?” This way you show support without smothering their accountability. Every element of the Multiplier best practices comes with clear examples of how you can change behaviour. 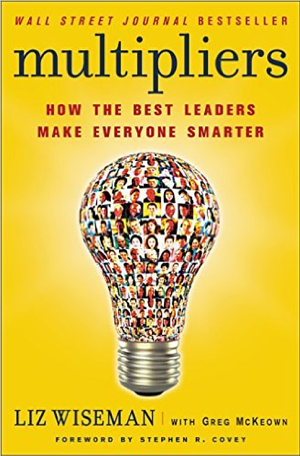 This is a profound read – it certainly impacted me as much as the leadership classics like Kenneth Blanchard’s ‘Situational Leadership’ and Covey’s own ‘7 Habits of Highly Effective People’. I believe this will also stand the test of time, is highly relevant to the current economic climate and more importantly, totally applicable to the Middle East region. If you are a business owner, CEO, or in a leadership role, this is a must read book. You need to know if you’re a Multiplier or a Diminisher and you need to know how to change your assumptions and behaviours to build the genius in others. Only once you’ve understood yourself, can you begin asking the rest of your team to change. Imagine if you could get twice the productivity from half of your team … what would it do to their worth and the worth of your business?